jeanseuss has no other items for sale. 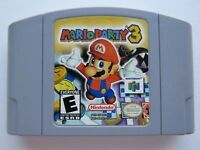 OEM Mario Party 3 Nintendo 64 N64 Authentic Video Game Cart Super Rare Fun GOOD! Bring out the party favors and blow up the balloons, Mario has once again decided to party hearty in this follow-up to 1998's video board game filled with mini-games. Mario Party 2 retains the same six characters and gameplay as its predecessor while offering new graphics, new mini-games and additional elements not found in the original. As with any party, certain guests didn't quite make the list, and all the mini-games that featured rapidly spinning the analog stick in a circular motion didn't receive an invitation to return. 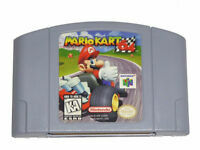 Nonetheless, a total of 64 mini-games are available on the 256-Meg cart, 44 of which are completely new. Some of these new games involve grabbing cakes speeding down a conveyor belt (Cake Factory), pounding totem poles into the ground (Totem Pole Pound), and sneaking past a sleeping Chain Chomp on your way to the exit (Sneak 'n' Snore)! For the curious, the following 20 games have returned from the original: Grab Bag, Face Lift, Crazy Cutters, Toad Bandstand, Handcar Havoc, Bobsled Run, Balloon Burst, Bowl Over, Crane Game, Hot Rope Jump, Platform Peril, Bumper Balls, Bombs Away, Tipsy Tourney, Hexagon Heat, Skateboard Scamper, Slot Car Derby, Shy Guy Says and Hot Bob-omb! Among the various games offered are Item Space mini-games (land on the space, complete the game and you'll earn a special item); Battle Space mini-games (all the coins are pooled from the players and a game ensues to decide who wins them); dueling mini-games (compete against a rival to earn coins); four-player mini-games (try to eliminate the other players from contention); two-on-two mini-games (team up with a player to challenge the other team); and one-versus-three mini-games (one player has to outlast a team of three). 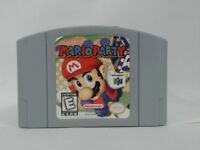 For those who have never experienced the original Mario Party, the game involves taking turns around one of five themed boards (Pirate Land, Western Land, Space Land, Mystery Land and Horror Land) as your character automatically moves along a twisting series of red and blue spaces. If there is an intersection, the player can choose which path to take, and there are a number of special spaces that can help shake things up if a player has the right combination of coins and luck. The new spaces in Mario Party 2 include an Item Space, where one player can earn a prize; Battle Space, where four players fight for the right to keep their money; Items Shop, where players can purchase special items to help influence play; Koopa Bank, which forces players to pay a set amount of coins each time they pass; Baby Bowser, who steals coins and replaces Toad's space after a player earns a star; and a Hidden Block, which randomly appears over blue spaces at various points during the game. As in the original game, the object is to accumulate as many stars as possible during the course of play. To do this, you'll need to move on a path leading to Toad's space. Once you reach the mushroom character, he'll give you the opportunity to purchase one star for 20 coins; buy the star and he'll magically transport to a new location on the board. Mario Party 2 is an excellent game. Played it last night with my cousin and had a blast. It's definitely been a source of quality time and entertainment in my house. Fun for parties or family night. This game is hella fun. Great minigames, great boards, and overall fun to play. Some things are limited like a lot of repeat minigames, but that's the enjoyment of this game. May be the best (luckiest) player win! Store down the street wanted $80 for this game and after looking online I was sketched out at first but after purchasing it was great. Worked fine with my n64. Getting Better Bit by Bit, Fun Game!!! This game has gotten better from the old one. I would still have to say that the computers are still hard to beat. The game does though offer great new levels and awesome characters. This game gets funner mini games and gameplay than the first one. Between the two I would have to say Mario Party 2 is the better one. This one is a good one to start on and learn more and more how to have fun with the game!!! This was in almost perfect condition which is weird for an n64 game. Only complaint is that the previous owner wrote their name on the front sticker but it's OK this is still a good product.